A vegan smoothie bowl is a quick and delicious vegan breakfast! 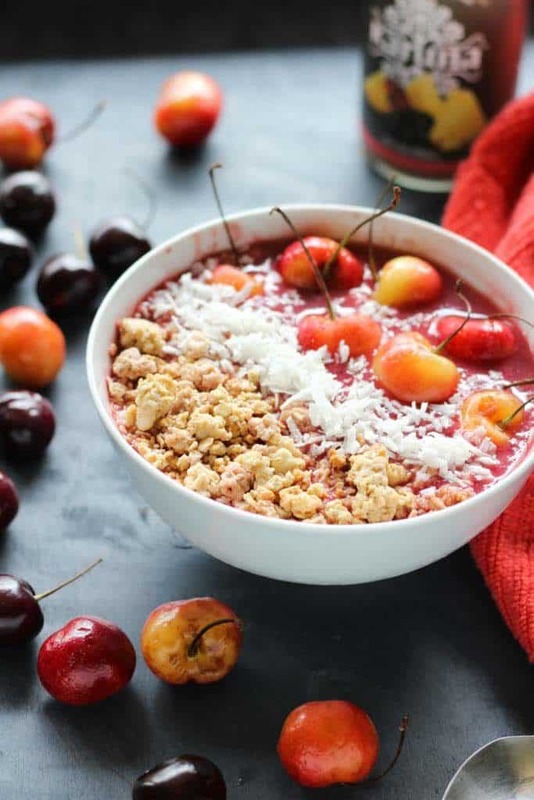 This vegan smoothie bowl is naturally sweeten with with cherries, strawberries, and bananas! This post was sponsored by Karuna and contains affiliate links. All opinions are 100% my own. Read full affiliate disclaimer here. Someone once ask me “what is the point of a vegan smoothie bowl?” In their mind it seems pointless to make a smoothie only to put it in a bowl and eat it with a spoon. But by this logic what’s the point of any liquid food that we traditionally eat? Why do we eat blended soup instead of drinking it? That’s all a vegan smoothie bowl is; blended food. Blended foods are great to included in your diet because they are already “pre-chewed”. This gives your digestive system a rest and allows nutrients to be absorbed quicker. For me, a vegan smoothie bowl is just a creative way to incorporate more blended foods into your diet. Because Valentines Day is near, I am using Karuna’s Divine Pinkalicious protein drink and romantic cherries for this vegan smoothie bowl. Did you know that Karuna stands for compassion? Compassion for others as well as the environment as a whole. They make their natural drinks ethically causing little harm to the environment, and with quality ingredients that benefit your health. What better way to say compassion than with the color pink! As curvy vegans, it is important to remember the compassionate part of our stance for our animal friends. Not only that, Divine Pinkalicious contains a protein powerhouse, quinoa flour, making this a great vegan protein drink on its own. Quinoa flour is a cleaner alternative to protein powders that are on the market today. It’s protein content is bio available for absorption so that means you are getting a high-quality source of protein. Cherries are known to reduce muscle inflammation and soreness. They have the highest antioxidant level and antioxidants help the body fight free radicals that ages us. Cherries can also help you relax and sleep well because they are rich in melatonin. What I like most about this smoothie bowl is that you don’t have to add any sugar to it. The a mixture of the Pinkalicious drink plus the banana gives it all the sweetness it needs. Feel free to top it with any type of ingredients you like; granola, shredded coconut, dried fruit, etc. the choices are endless. And if you still don’t get the whole idea smoothie bowls, use this combination as a regular smoothie! Enjoy! DID YOU MAKE THIS RECIPE? Tell me how it turned out for you! Was it a hit or miss? Do you normally eat vegan smoothie bowls? If so what is your favorite combination? Tell me about it. Leave a comment below, rate it, and PIN IT! Also tag a photo @_VeganWithCurves and hashtag #VeganWithCurves on Instagram so I can see it! Take your frozen strawberries, frozen cherries, and banana, add to a blender. Next pour in Karuna’s Divine Pinkalicious drink. Blend all together until smooth and thick. You want to make sure the consistency is fully blended but not too “liquidity”. It should come out very thick; a slushier like texture. Top with your favorite granola or nuts and seeds. Karuna’s natural bottled drinks are available in the Chicago and St. Louis area and will be expanding! If you currently do not have access to these drinks use your favorite plant based milk instead. Use any berry you desire. Get creative and mix and match! Gina Marie is a food photographer and food writer who loves fitness and creating vegan recipes on her food blog Vegan With Curves. She was born with Amniotic Band Syndrome (ABS) which resulted in her having a natural amputation of her fingers and toes at birth. Gina Marie focuses on balancing healthy eating and healthy body image.